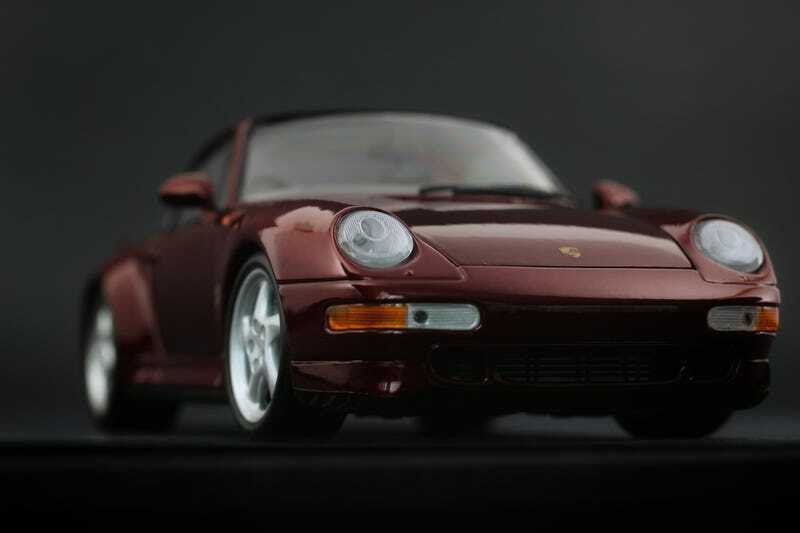 This is the UT Models Porsche 993 Turbo. Even if you’ve only clicked on LaLD once in your lifetime, you know that these old, now defunct brand is one of our all-time favorites here among Team 1/18. They were AutoArt before AutoArt was cool. Part of the reason why they were so cool was the era they were around. How many rad cars were around in the early to mid-90's? The McLaren F1, Ferrari 550, Porsche 911 GT1 Strassenversion, Impala SS, E36 M3, and even a damn Eddie Bauer edition Ford Explorer; all made by UT. Oh yeah, and a whole line of 993 Porsches. This one happens to be the Turbo model in a burgundy maroon-ish goodness color. Why did I get this color? There’s a guy in my neighborhood who has one of these on a lift in his garage. I’ve yet to get my cajones together to ring his door bell and ask if he has a best friend. This one came to me through our old LaLD buddy “13". He sent me the link for this Buy it Now or Best Offer listing after we were competing bidders on another car. He said shoot him a low offer and see what happens, and to my surprise, the seller accepted! You’ll see these “listed” for crazy prices, but if you’re patient, you can grab one for $60 just like we did.